The perfect balance between comfort and efficiency. Space, performance, and style are some of the features that make Latitude one of Cessna's most desirable aircraft. The model is the first in a new family of Citation jets, with an even larger cabin that promises to revolutionize travel. This aircraft features the most advanced technology. Controlled by fully intuitive touch screen interfaces, the Latitude incorporates state-of-the-art Garmin G5000 avionics, recognized for their ease of use and reduced workload for pilots. 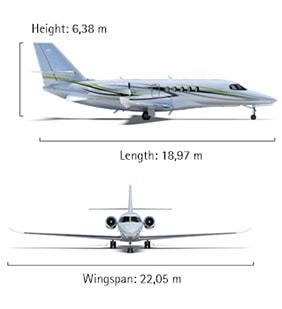 The Citation Latitude has expanded the concept of interior space in mid-sized executive jets. Its cabin is 1.95 m wide by 1.83 m high, increasing the level of comfort of passengers and crew. In addition, its floor is totally flat, which makes movement inside the cabin easier. The interior of the Citation Latitude is sophisticated and was developed to meet the most demanding requirements. There are several options of finish, all of them meticulously crafted and made of high quality materials, including hand-sewn leather and polished wood. Impress and be impressed by the attractive and contemporary design of the Citation Latitude. When you board the Latitude and enjoy its spacious and comfortable cabin, you will discover a new way to fly.